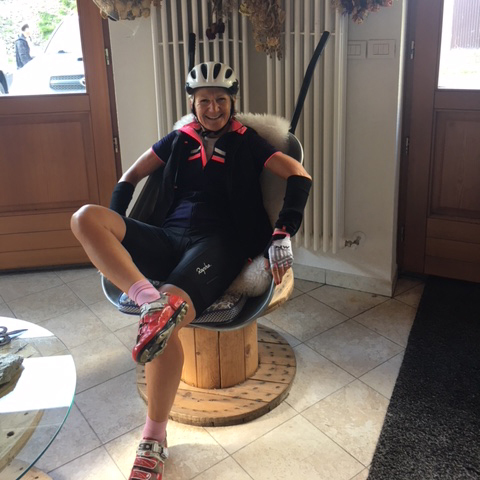 Deborah Heath, owner of Design by Deborah, member of Fine & Country Interior Design is cycling from Geneva to Trieste from 15th-24th August to raise money for homelessness. The challenge is called Raid Dolomite. 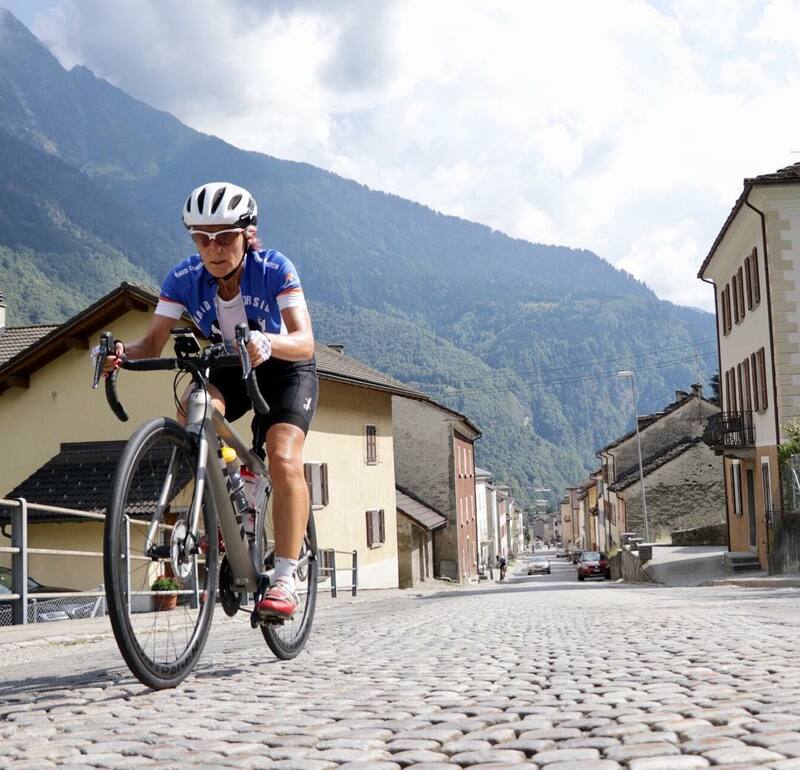 Deborah is riding through three countries and to ascents of 3,100m (10,170 ft). Deborah is sending us daily updates to let everyone back home know how she is getting on. To support Deborah’s challenge, please click here. 201 km with 2,580 m ascent. Deborah at Lake Geneva, ready to begin the 201 km for the day. 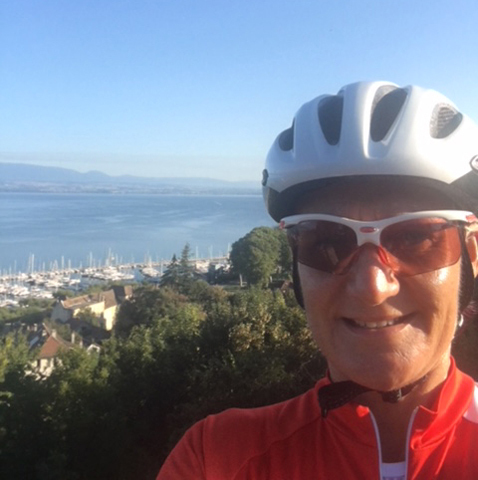 Deborah and the riders left the stunning shores of Lake Geneva and rode through the Alpines. The day began hot and steep with flat(ish) sections as they descended into Switzerland’s Rhone Valley. They passed through the 2,000 year old Swiss towns, Martigny, Sion and Sierre before reaching their bed for the night in Simplon. Deborah and her fellow cyclists at the top of the big climb, five miles from their hotel and suffering from cramp but with big smiles. “The Swiss love their bells! Last night our hotel was in a small Swiss village with a church that chimed its bells every 30 minutes. Even ear plugs couldn’t block the noise. “We had another tough day today: 157 km and 2240 m of climbing. Temperatures rose to an energy-sapping 35 degrees Celsius. Thankfully, we missed an incredible thunder storm was struck over dinner. “The scenery was stunning, but the start of the day had some busy roads. After lunch, it was refreshing to ride away from the noise, albeit some of the climb was challenging, including an 11 per cent ascent through cobbled villages. 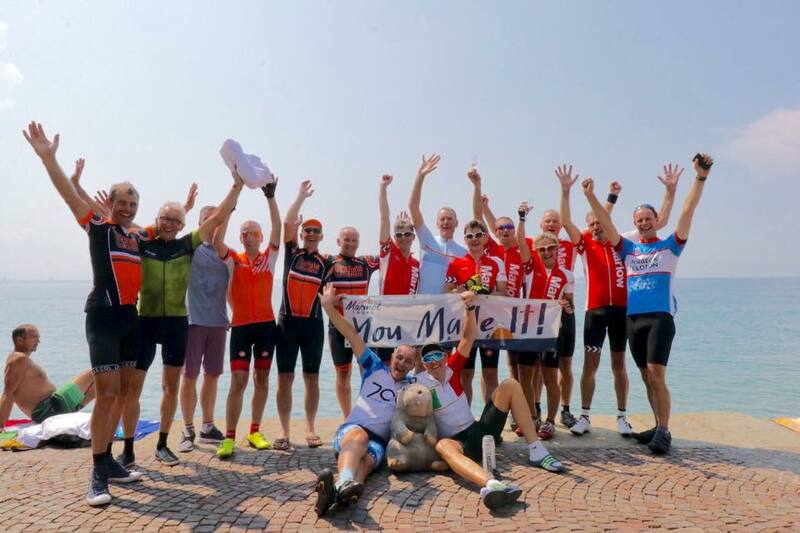 We started and finished the day in Switzerland with an interlude into Italy in the middle of the day. “Today started with a climb: eight per cent as soon as we left the hotel. There was no time to warm up making it was a brutal start to the day. We moved onto a sharp downhill stretch through tunnels, roadworks and lots of hair pin bends before the steepest climb of the day. “I much prefer to be away from the roads. It was stressful riding while keeping a close eye out for vehicles speeding along the winding mountainous roads. We stopped for a quick lunch then a 30 km climb with the threat of thunder storms looming over. We could hear them rolling around the mountains, but managed to get back to the hotel as the first few spots of rain appeared. The rain tipped down all evening. “As you would expect, the views are beautiful, but St Moritz doesn’t look as impressive without the snow. We had breakfast and coffee in Switzerland, lunch in Italy and back into Switzerland tonight. So far, we rode through the Italian and Swiss Alps and will move into the Dolomites tomorrow, spending the rest of our adventure in Italy. The coffee will certainly be cheaper! 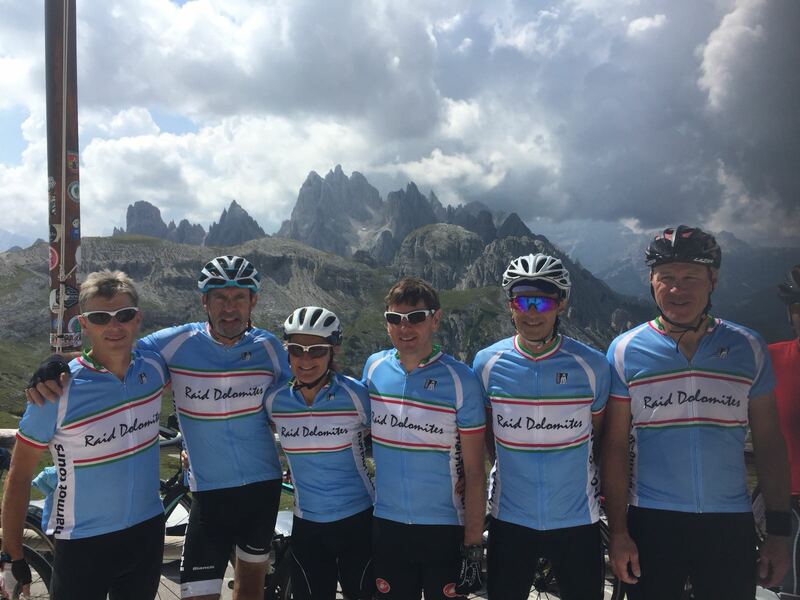 “Over six hours in the saddle and we are finally in Italy and the Dolomites. We rise 143 km with 2900 m of climbing which was tough, however tomorrow is the same distance, but with 3260m of climbing. The weather was kind to us and waited until we all finished for the day before the afternoon storms appeared. “Stelvio was the last of five climbs, but in height gained it was more than the others put together. It seemed as if every Italian motorcyclist in this region decided to come up the road to Stelvio too! 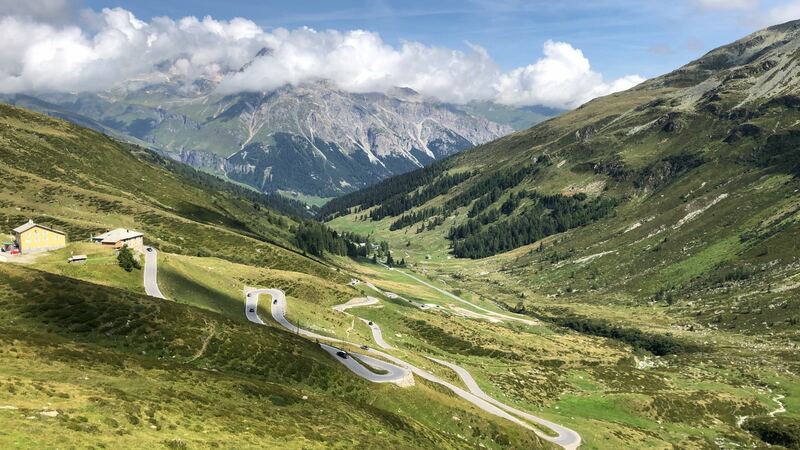 “We have seen some interesting sights including: a woman carrying a small dog in a ruck sack up the climb, a large lady on a motorised bike breeze past us and a professional cyclist gave us some tips. Safety first from Marmot Tours. “Today was a mammoth day with both distance and climbing. I am absolutely shattered. We began our stint in the Dolomites, the mountain stretch in northeast Italy. 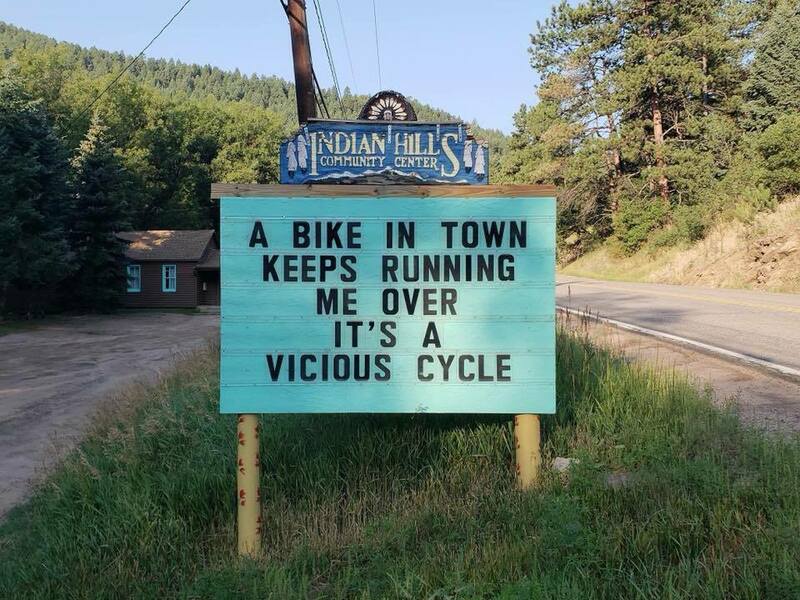 I had to keep reminding myself to look around me while I was cycling to see the incredible views surrounding me. Mountain views across the Dolomites. 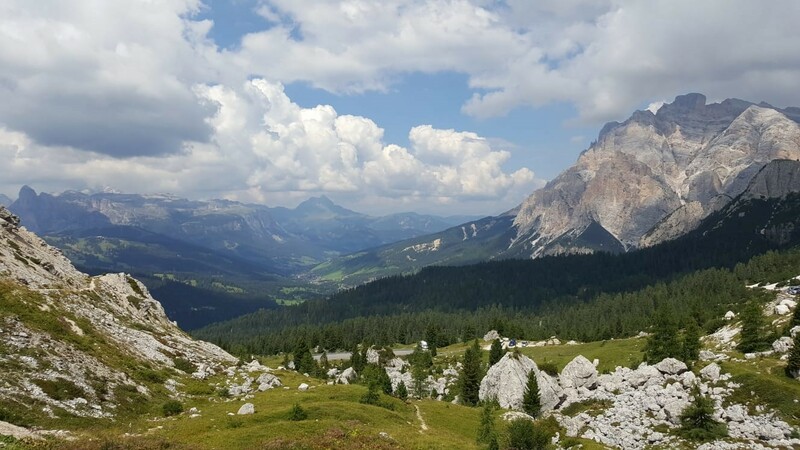 “Today we moved further into the Dolomites. The limestone stacks are spectacular. “I am typing this listening to yet another evening thunderstorm. Each day we are not sure if we are going to make it back. Yesterday we weren’t so lucky. “We had a monster climb at the end of the day today called Passo de Giau. It was the fifth climb of the day with 10 km at 10 per cent incline. Normally, we climb these hard climbs one km at a time. 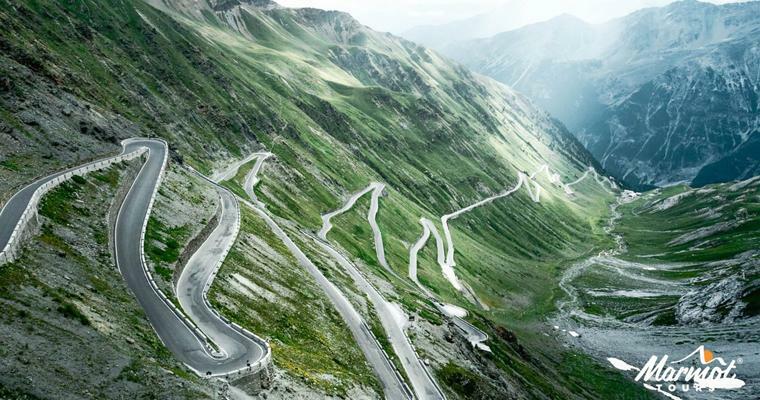 This is another iconic climb of the Giro d’Italia. Team photo from the top of their climb. “Today was a ride 66 km, which compared to other days was short. However, it wasn’t easy. We had a monster climb to do. We did the Tres Cime which is in the Dolomites National Park. The last 4 km of the iconic climb averaged nearly at 12 per cent incline with parts of it reaching 18 per cent! “It was mind over matter that gets you to the top, but despite the pain I made it. You just have to keep the pedals turning and eventually you get there. Deborah powering through the villages. “It was another long day today with mixed feelings: we are so near the end, but have so far to go. 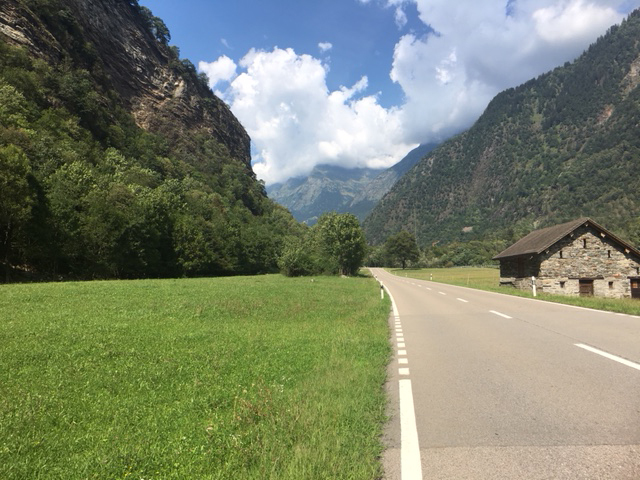 The exhaustion has built up over the past eight days so the five cols (climbs) were particularly tough. “The first climb today was so painful. We were all shattered with aching legs and sore bottoms. After seven to eight hours of cycling each day, this is to be expected. “We were full of adrenaline and excitement so cycled really quickly today. We reached the finish line in just four and a half hours. 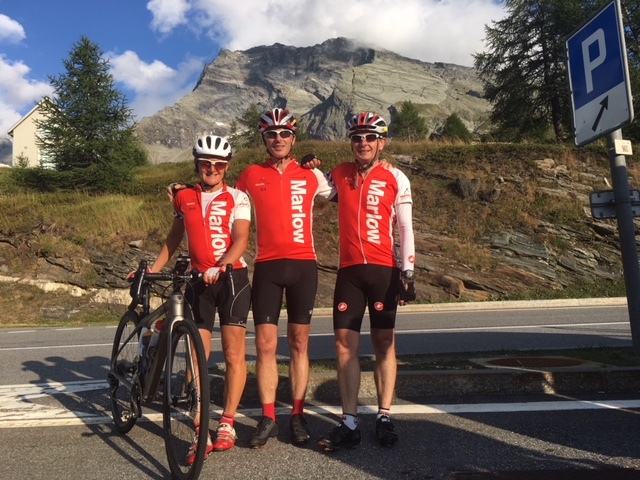 “I rode with a lovely group and would definitely recommend a cycling challenge for The Foundation with Marmot Tours. I felt safe and looked after the whole time. There was a fantastic sense of euphoria each evening when we realised how far we had ridden. To support Deborah’s incredible journey to raise money for homelessness, please click here.